• Pepper crushed - 1 pinch. • Chopped onion - 1 small. • Maida - 1/4 cup. • Chopped gr chilli - 1 pinch. • Chopped ginger - 1 pinch. • Rice flour - 1 cup. • Sooji/rava/semolina - 1 cup. • Ghee/butter/oil - 1 teaspoons. Mix all ingredients as shown. Then add water (or buttermilk) and make a thin batter and sprinkle over hot griddle if it is not a nonstick pan, spray non-stick spray, wipe clean and sprinkle the batter and apply butter or oil. Serve hot with pickle, chutney. Use potato stuffing to serve it as a stuffed masala Rava Dosa. Rava dosa is a very tasty and crispy semolina pan cakes.It is a perfect breakfast that can be prepared and served instantly with any chutney. 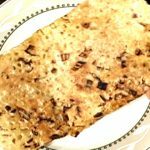 Rava dosa (quicky version) or Instant Rava dosa is a very tas... Read More..
Rava dosa (quicky version) or Instant Rava dosa is a very tasty and crispy semolina crepe/ pancakes and a perfect for a quick in easy breakfast. Rava dosa is a favorite recipe in many homes and there are different versions in the measurements of rice flour, sooji (semolina) and maida (all purpose flour). The rava dosa is a quick and easy to cook dish which is made delicious and tastes best with sambar and chutney. Unlike the ordinary dosa, this recipe does not need to be fermented. 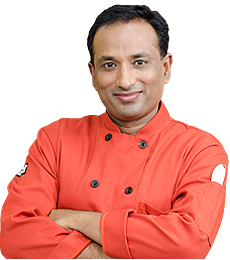 For making ordinary dosa, we need to the leave the batter for about 6-7 hours to ferment (or overnight ferment). For Rava Dosa, the ingredients need to be soaked for just 30 mins to 1 hour. This is apt for the jiffy tiffin making. Rava dosa is a combination of rice flour, maida and suji and water to get the right consistency, allow standing for 30 mins. Temper the batter with cumin seeds, green chillies, curry leaves, grated carrot and salt. Pour the dosa onto the hot griddle to get crisp and delicious dosas. Remove and serve hot with Tomato Chutney, Peanut chutney, Ginger chutney or with Peanut powder and Sambar. A basic dosa is a fermented crepe or pancake made from rice flour and black lentils. It is a typical dish in South Indian cuisine, eaten for breakfast or dinner, and is rich in carbohydrates and protein. It is a day to day diet for people in present day Tamil Nadu, Andhra Pradesh, Karnataka and to some extent in Kerala also. Dosa is also popularly known as dhosha, dosay, dosai, dhosai, tosai, thosai, or dvashi in various regions as per their language. In different countries it is spelled in different manners, for example, in Malaysia and Singapore it is spelled thosai, because of the different way in which Tamil is transliterated in South-East Asia. Though dosa typically refers to the version made with rice and lentils there are many other versions of dosa exist and are popular in varying degrees. This is sometimes specific to a region in India. Other types of dosa include: Pesarattu green moong dosa, ragi dosa, banana dosa, masala dosa and so on. To prepare the rava dosa firstly mix all ingredients (sooji or semolina, all purpose flour – maida, rice flour) add water (or buttermilk) and make thin batter and sprinkle over hot griddle if it is not a non stick pan, spray non-stick spray, wipe clean and sprinkle the batter and apply butter or oil serve hot with pickle, chutney, use potato stuffing - just as used in masala dosa. It takes practice to prepare rava dosas. Usually many do not get the batter of the rava dosa perfect. 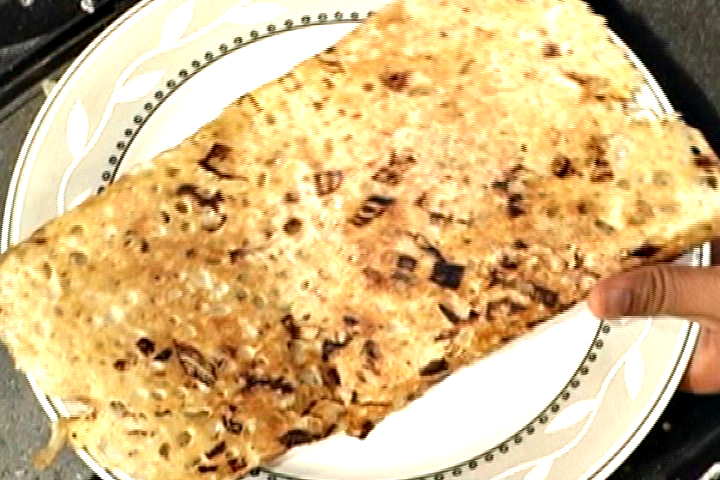 To prepare this dish you need to keep few things mind while making dosas. The batter has to be prepared atleast an hour or half before you want to eat. There is no need of fermentation for the rava dosa batter unlike the masala dosa batter. This is an instant preparation. The batter should of pouring consistency like a thick buttermilk consistency but not very thick. Resting the batter in the fridge for a few hours also helps in making a crisp dosa, not that you cannot prepare crisp dosas with batter sitting for just an hour. The most important factor in the making of this dosa is adjusting the heat control. An iron tawa or griddle requires higher heat as compared to non-stick pan. There are many variations in preparing rava dosa. You could add grated carrot and coconut to the batter along with rest of ingredients, Or add some sliced onions while the dosa is cooking. Broken cashew nut pieces can also be added to the dosa batter. At the time of preparing dosa, use the ladle to stir the dosa batter well, as all the flours mixture tends to sink to the bottom of the vessel like a thick residue. So combine well each time you pour the dosa batter over the tawa. Use considerable oil as it helps the rava dosa get crisp. (forget of the calories if you want to relish a perfect crisp rava dosa). Do not store the batter for more than 2 to 3 days in the fridge or else it will turn sour. Vah 're vah.fantastic.you really inspire me.you are a wonderful chef n teacher. Awesome Rava Dosa, easy and quick to prepare? I tried making rava dosa on an iron tava. The dosa does not come out easily, the bottom of the dosa does not come off the tava and the top remains soft uncooked. Can you advise me why this is so.? soooper i will do it? bcoz of u...I made this dose so many times ...every time it cums amazing. ..thanks for this wonderful recipe chef ...you are d best. ..? You are the most enthusiastic chef in the world. And I love it. LOOK AT THA CULUH? i enjoy your recipy and your styl of taking very much? Awesome Awesome Awesome. I will try making this awesome dosa on Sunday. Thank you ? I just can't stop loving you:-)?